DPD Pro is a breakthrough pr oduct developed specifically for the commercial pool and spa market. Among public pool operators surveyed, it’s clear that a faster and easier DPD testing method is desired. 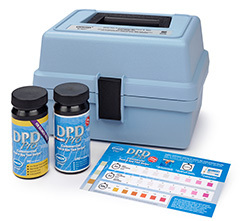 DPD Pro offers the convenience of seven key parameters in 2 multi-way test strips conveniently packaged in a sturdy test kit. The color chart included in the kit is durable – both UV and water resistant – so it will withstand normal use over an extended period of time. Test strip refills for the kit are available. Kits and refills are sold in packs of six.